Reversible snuggle Tunnel provides a snug and secure nest to keep your pet warm and cosy. This reversible tunnel can be easily cleaned as it is made of a soft nylon fabric for winter and polycotton for summer which is both machine washable. 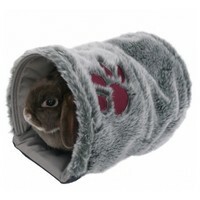 This fun cosy tunnel is suitable for any small animal such as rabbits guinea pigs, ferrets and Degus.